Credit: X-ray: NASA/CXC/MIT/H.Marshall et al. Radio: F. Zhou, F.Owen (NRAO), J.Biretta (STScI) Optical: NASA/STScI/UMBC/E.Perlman et al. NASA's Chandra X-ray Observatory has given astronomers their most detailed look to date at the X-ray jet blasting out of the nucleus of M87, a giant elliptical galaxy 50 million light years away in the constellation Virgo. 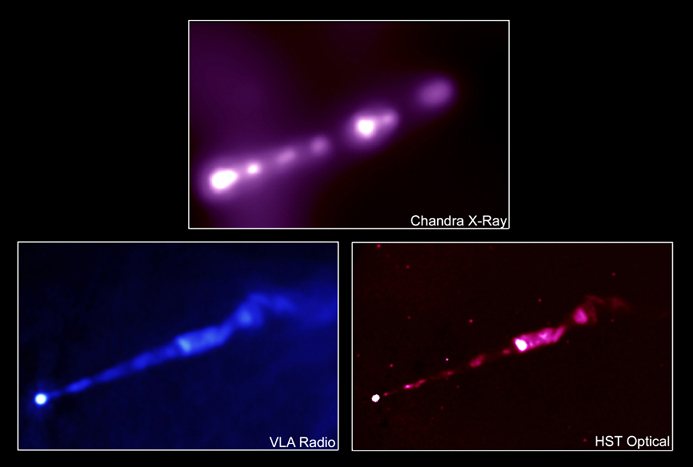 The X-ray image of the jet reveals an irregular, knotty structure similar to that detected by radio telescopes and the Hubble Space Telescope. At the extreme left of the image, the bright galactic nucleus harboring a supermassive black hole shines. The jet is thought to be produced by strong electromagnetic forces created by matter swirling toward the supermassive black hole. These forces pull gas and magnetic fields away from the black hole along its axis of rotation in a narrow jet. Inside the jet, shock waves produce high-energy electrons that spiral around the magnetic field and radiate by the "synchrotron" process, creating the observed radio, optical and X-ray knots. Synchrotron radiation is caused by high-speed charged particles, such as electrons, emitting radiation as they are accelerated in a magnetic field. By using the High Energy Transmission Grating (HETG) with the Advanced CCD Imaging Spectrometer (ACIS) detector aboard Chandra, the scientists were able to measure accurately the spectrum, or distribution of the X-rays with energy. This provided strong support for the model where electrons are accelerated to high energies in the knots, radiating X-rays by the synchrotron process. The spectrum and intensity of the X-rays from the galactic nucleus also indicate that this radiation is not caused by hot gas produced by material falling into the supermassive black hole. Instead, a high-energy, as yet unresolved, outflow close to the black hole may be producing the X-rays by the same synchrotron process that explains the knots in the jet observed by Chandra. A team of astronomers led by Herman Marshall of the Massachusetts Institute of Technology in Cambridge used Chandra to observe M87 for 10.6 hours on July 17-18, 2000. According to Marshall, one of the remarkable findings of the investigation is that the knots near the core are much brighter in X-rays than the farthest knots, relative to the optical and radio bands. While the exact reason for this dimming is unknown, it is likely to be related to the slowing of the jet, which was discovered using the Hubble. 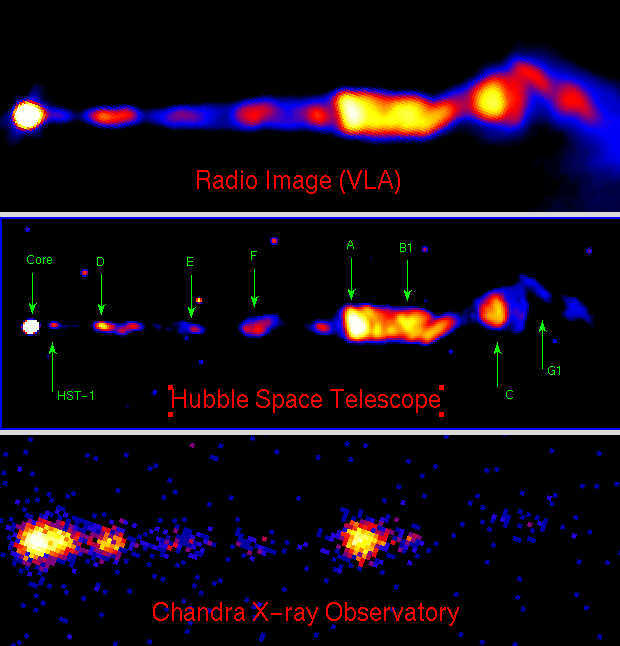 Credit X-ray: NASA/CXC/MIT/H.Marshall et al. Radio: F. Zhou, F.Owen (NRAO), J.Biretta (STScI) Optical: NASA/STScI/UMBC/E.Perlman et al. Scale Image is 32 x 21 arcsec across. Coordinates (J2000) RA 12h 30m 49.40s | Dec +12° 23´ 27.90"